At the holidays there are times when you can get gifts that you just don't want. It may be a duplicate, the wrong size, or you simply don't like it. There are various things you can do with that item: return it (often with or without a gift receipt), throw it out if not overly valuable, and even regift it. Regifting, passing the gift onto someone else, usually has a stigma attached to it, but is it really so bad? At least the item has a chance to be used instead of ending up in a landfill. But there is another way to look at regifting with a positive spin: donate it. 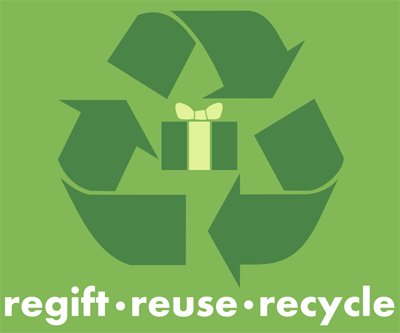 Depending on the item, there are various ways to donate an unwanted gift so that it will have value to someone else, especially others in need. One of the easiest ways to make a donation of an item is to take it to a multi-purpose charitable reseller such as Goodwill or St. Vincent de Paul, or an organization like Purple Heart who will even pick it up from you. They use profits made by selling the items to fund programs and services for those in need. But the return on the value of the items is low as they sell at huge discounts to the value of the item. In some cases, items can be donated that will end up having a greater value to an individual or organization. Items of clothing are perhaps one of the easiest to pass onto an organization that can make good use of it. They can have an immediate impact om someone's life either to keep them warm or to get a job. Warm weather clothes are needed by the homeless and can be donated at various drives including Mitten Fest, the very Milwaukee event of drinks and music outside in winter. If the clothing item could be considered part of a business or work wardrobe it can be donated to be worm to an interview or even to a new job. Bottomless Closet takes not only women's but also men's clothes, and there are usually drives throughout the year such as Suits for Soldiers to collect clothes for veterans. The same could be said for personal hygiene items - got a cologne you don't like? - donate it. Another thing to think about is donating to an organization to be used for an auction or raffle. Many organizations have auctions or raffles where they need items to be bid on or tickets purchased to win. May different items can be utilized in this manner such as art or even alcohol. I am sure you have seen some raffle 'baskets' to have an idea of what could be of value. When a package is put together with desirable items, the return can often be beyond even the value of the items and when donated cost nothing to the organization so it becomes pure profit. You may have to keep the item on the side for a while, but it will be well worth it for the organization. These are just a few of the many creative ways and places to donate items that can give them more value than what you might get by returning or trading in the item. Please consider 'regifting' any gifts to an organization.